When I booked this trip, I didn't know it was the Diamond Jubilee, celebrating 60 years of Queen Elizabeth on the throne. 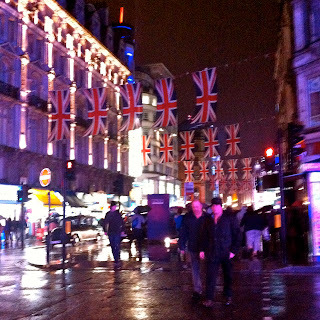 But, it made for a very Union Jack experience... and I've never met a Union Jack I didn't covet. 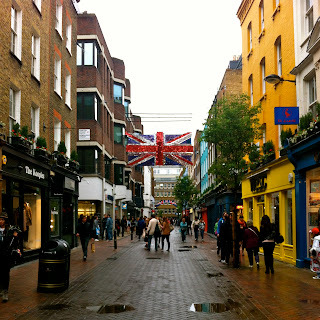 On the way back to my hotel, dumb luck took me down Carnaby Street which ended up being my favorite shops of the day. I still wish I had picked up the Grumpasaurus t-shirt from David & Goliath and the cool punk jewelry at The Great Frog. 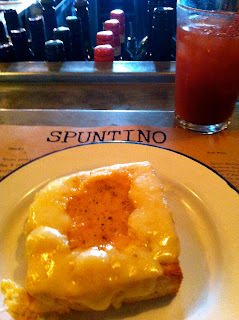 I'd been hearing all about friends who had great meals at Spuntino, so I popped in for brunch. 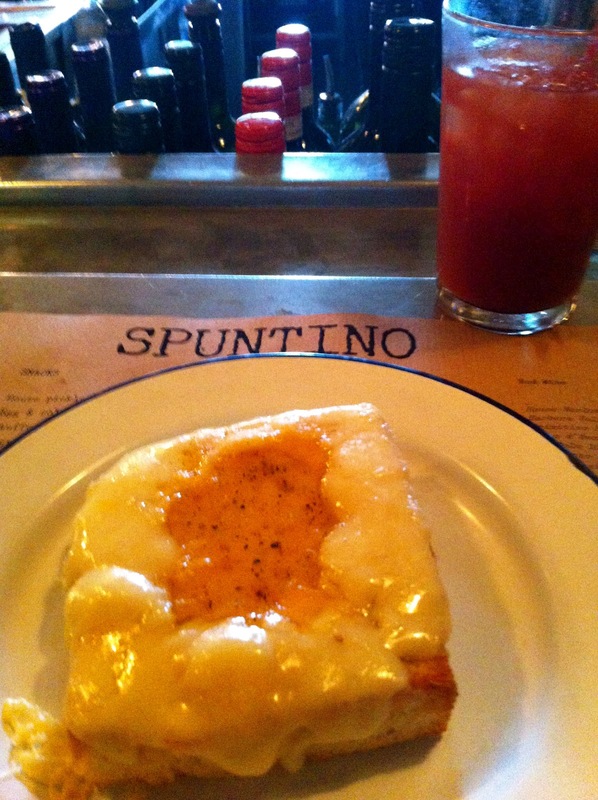 They had me at truffled egg toast and a Bloody Mary. Everyone had also been raving about Hummingbird Bakery cupcakes on Portobello Road, but honestly, trendy cupcakes are getting on my last nerve. I passed a Hummingbird outpost near Spuntino though and their Jubilee Union Jack cupcakes sucked me in. I decided I could justify it by getting one to take with me down to the Thames and that my personal tribute to the Queen would be toasting her with a cupcake. 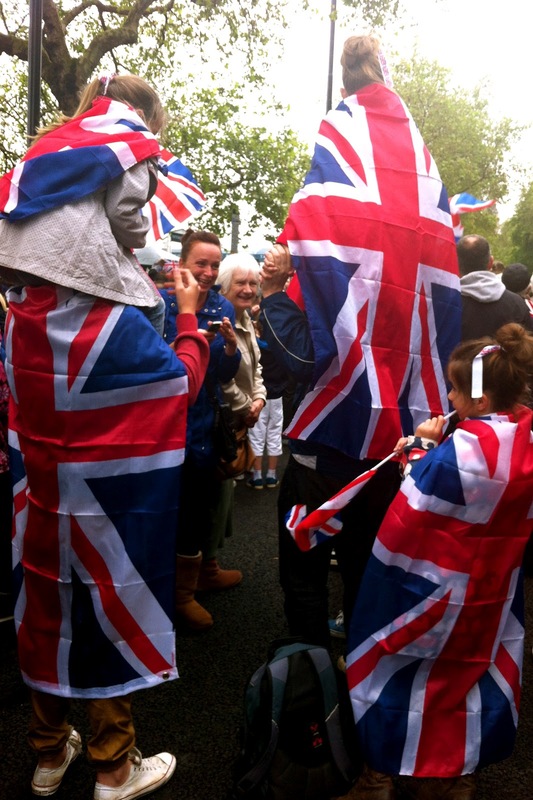 After that, I booked it back to my hotel to blow dry my shoes and decide where I wanted to attempt to watch the royal barge on the Thames for the Diamond Jubilee River Pageant. I decided that since I hadn't yet seen Parliament or Big Ben or the London Eye yet, I'd head down to the Victoria Embankment. 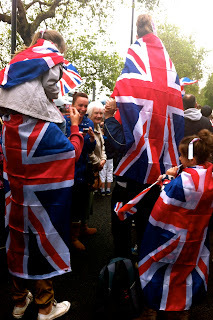 It was perfect - jam packed with partying and even though I couldn't get a spot on the river, they had enormous big screen TVs to watch the royals go by. It was neat to be near the spectacle and with such history all around me. But, honestly, what I was most impressed by was the Queen's stamina. She stood for hours and hours and hours. At some point, I had to head back home to dry off and relax before dinner. But, she was still there, in the rain, taking it all in. Sixty years ain't nothing to shake a stick at... as soon as I got home, I downloaded this biography to learn more about her and her ascension to the throne. Me toasting the Queen as she passed by on my left. With the River Pageant behind me and a long flight home the next day, I had a great wild rabbit tagliolini at Jamie's Italian with Dominic, enjoyed a walk back through Piccadilly Circus to my hotel and settled in to a deep sleep. PS. Clearly, I'm smitten with London, but if you need a Union Jack fix back in Washington, DC, stop by Foundry on U Street. Designer Yvette Freeman is equally obsessed and has a store full of unique Union Jacks for your home. Wow what a weblog i am so happy to here can you more discuss here, i am back again again to your site as soon as possible and i have lot of collection for you just click here for more information.